The premier planning, grading, and tracking program built with the features and tools your family needs to create a safe and secure web-based record of your educational journey. Keeping track of grades is no longer a headache. We average grades and determine GPA’s so you can throw away the calculator. You can enter a number grade or a letter grade, it’s your choice. There’s even an option to assign lessons without grading them, which is perfect for the younger ones. No more groaning about grades. Choose from our extensive curriculum collection or add your own. 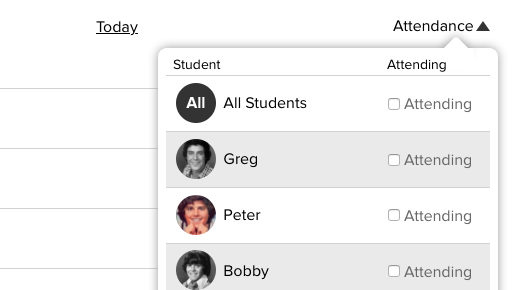 Copy a class from one student to another (great for siblings that are close together in age) or add multiple students to one class (great for families with multiples or co-ops) Add notes to individual lessons and print a lesson plan to encourage independent learning. From 4-H to community service projects and everything in between, My Home School Grades tracks your involved student. My Home School Grades allows you to show how well rounded your student is and how they are ready to take on the world! Our transcripts are being accepted by colleges and universities across North America! You can be confident that your student’s educational journey will be professionally presented, with all the necessary information for whatever the future holds. 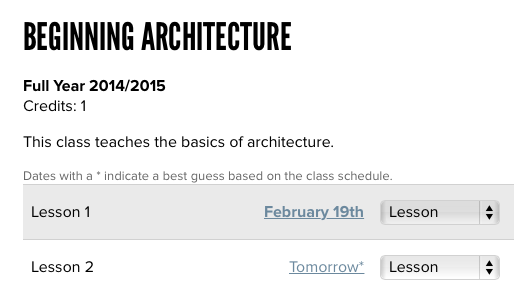 See your lessons side by side with your events for the day. Schedule individual or recurring events. Quickly move forward in time to see what you need to prepare for. Rescheduling a lesson? 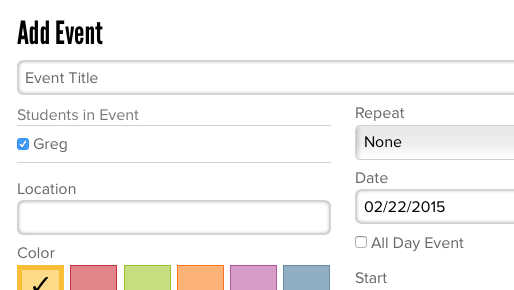 Our planner can automatically reschedule the dates of future lessons so you won’t have to worry. My Home School Grades tracks attendance either by the day or by hours per day. Easily generate reports that may be necessary for your state or local reporting requirements. 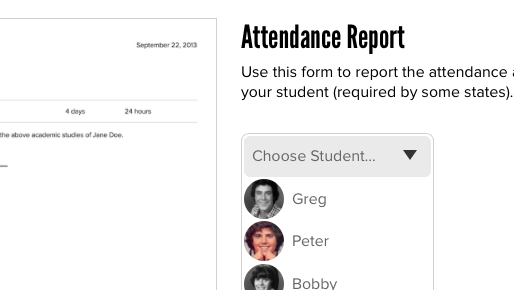 Attendance is color coded by student so you can tell at a glance whether you’ve missed a day. 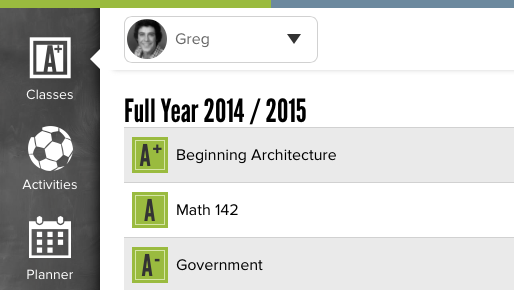 My Home School Grades allows you to professionally report what you’ve accomplished. Our ever expanding library of document options give you the flexibility to provide as much, or as little information as needed to meet state or local reporting requirements. I used to create my kid's transcripts by hand, but not anymore! My Home School Grades makes the process so simple, I can even update assignments and their transcripts from my phone when we're on the go! 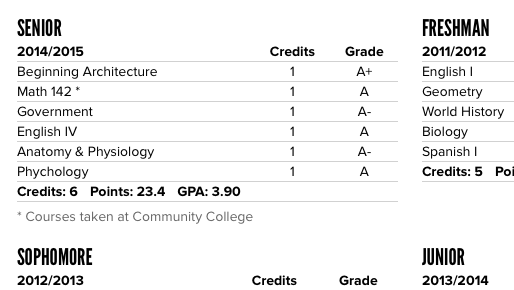 As if that isn't great enough, a college admissions officer told my daughter that her transcript from My Home School Grades was the most professional she's ever seen. I highly recommend My Home School Grades to everyone who home schools! My Home School Grades helps keep our family on track with where we are going. I had all the information stored in my head. I was able to put all that information into the system. That freed up a lot of brain space! Now I don't have to wonder where we are and how we are progressing. I love My Home School Grades! I'm so incredibly grateful for My Home School Grades! 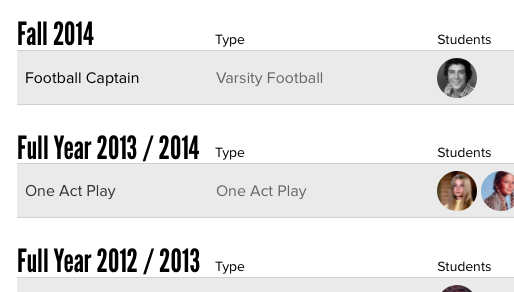 I was worried sick about how to track my son's high school activities. I'm not worried anymore! I love that I can keep all of my kid’s school and activity information in one place. It helps me stay organized! My Home School Grades is a wonderfully intuitive program that makes keeping up with grades a breeze. I enjoy the peace of mind it affords me due to the ease of use and flexibility. I would highly recommend it, in fact I will, to all my home school friends in Texas! I love everything about My Home School Grades! It has made my life so much easier as we approach middle and high school. My Home School Grades fills a huge gap that has been missing for home school families! My Home School Grades is definitely a godsend. When I first subscribed, I had a senior and an 8th grader at home. Having My Home School Grades gave me peace of mind, knowing that my kids' grades were on my account and secure. Moreover, I was able to have a professional-looking transcript for my son when he graduated! I am so glad I found My Home School grades! It helps keep me organized and it is easy to use. I like the fact that I can generate a professional looking transcript at the end. I would highly recommend this program to a friend! I had created a spreadsheet to track my children's transcript information, but my wife was always confused by it. Your software made the work of building a transcript so easy for her - inputting information, seeing results - that it was a "no brainer" for me to support. Instead of me being the middle man in transcript production (she does most of the home schooling for our family) now she can input information when she wants and has no hesitation at all with using your software. Kudos for making such an easy to use product! You can reach us via email anytime or call our toll free number seven days a week from 6 AM - 10 PM Pacific time. We pride ourselves in responding quickly to your requests. You can also find us on Facebook, Twitter, Google+, and Pinterest.